I believe and have been told that the Harley Davidson 1947 Knucklehead Springer for Sale is all original to the time period of the bike. Please understand that I am not an expert on old Harley Knuckleheads and I can't say that everything on this bike is 100% original but what I CAN say is that if you find something that may be off a 1946 or a 1948 (which I've beleive there is not), just remember I stated up front I am not a Knucklehead expert. Below you will find a listing of everything that I can include to let you know that to the best of my ability I want to ensure your satisfaction. This old Harley belonged to my father-in-law that passed away and it sat idle for 25 years but it is a smooth running, eye-catching machine! I bought it and spent many, many hours going through it and making it a head spinner that will get lots of envious and admiring looks from those you ride by on the road. 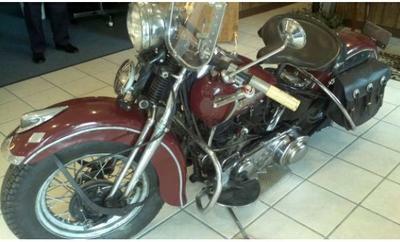 To be fair, it's not quite in showroom condition; it looks like a 1947 Knucklehead. The actual mileage of the motorcycle is unknown as the trip meter still works but the odometer does not. It got a a new paint job 2 years ago in the original red paint color (slight orange peel) and the chrome pieces were cleaned up and Kromated but the exhaust pipes did not take the chrome as well as the other pieces. I have lots of original 1947 Harley Davidson Knucklehead Springer parts that came off of this motorcycle that were replaced due to wear but not discarded that will go with the bike. There are very very few dings and dents on this old Knucklehead and I really hate to part with it but I need the money since I am buying a farm. If you would like to hear it run I have uploaded a video of it on you to you. All you have to do is copy and paste (http://youtu.be/yFLgXdriVHs) in the YouTube search bar to access it. There are two separate videos on Youtube where you can see it and hear it run. If you would like to voice your opinion, make comments or write a review on the old Springer you are welcome to do so using the space below that has been provided by Strike Lightning Used Motorcycles for Sale (and PLEASE do not neglect to include your contact information in your email or to provide a phone number or email address!) so that I can respond with answers to your questions or after consideration of your best offer as quickly as possible. In my opinion you won't find a better deal on an old 1947 Harley Knucklehead Springer for sale in Scottsburg Indiana IN, on Craigslist or in an Ebay auction so hurry and make an offer before this beauty gets away from you! GoGoCycles would also encourage bikers to submit a review of the Harley Davidson 1947 Knucklehead Springer for Sale to make the biker community aware of any problems that are commonly associated with this old Harley or to highlight its positive features and help potential buyers make informed decisions. You can send me an email if you're interested and I will return your call ASAP. I start work at 4 in the morning but I can call back on my breaks so leave a message and don't forget to mention that you found this ad on gogocycles.com. My preferred method of payment is in cash only and the sale of the motorcycle will be pickup only as I will not be able to ship this motorcycle.